2017 Teen Summer Job Outlook: Bulk of Jobs Could Come Midsummer | Challenger, Gray & Christmas, Inc. While the economy continues to show signs of strength, industries that traditionally cater to teen workers are scaling back, meaning opportunities for teens might appear in unusual places or later in the summer when retailers have assessed consumer demand, according to an outlook released Tuesday by global outplacement consultancy Challenger, Gray & Christmas, Inc.
“Retail, including long-standing clothing and accessories stores, are pivoting to online sales and continue to cut in-store workers,” said John A. 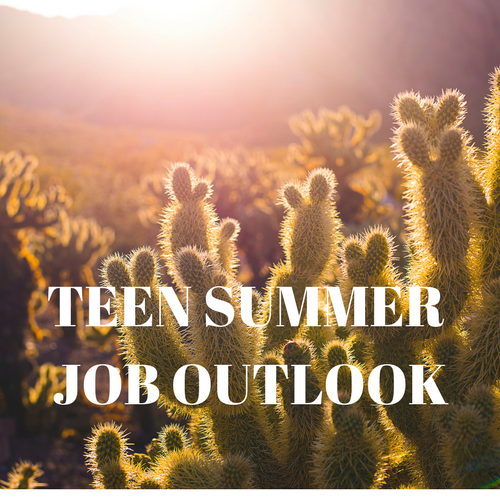 Challenger, chief executive officer of global outplacement firm Challenger, Gray & Christmas, Inc., which released its annual teen summer job outlook on Tuesday. Indeed, retailers have cut over 34,000 jobs in the first two months of the year, according to Challenger tracking. The Bureau of Labor Statistics tracked 26,000 job losses in general merchandise stores; sporting goods, hobby, book, and music stores; and electronics and appliance stores in February. “If retailers do decide to beef up hiring, it will likely be later in the summer for back-to-school season leading up to the winter holiday shopping season. In the meantime, teens who want summer employment should look in non-traditional areas and tap into older, employed contacts to seek out possible positions,” said Challenger. Last summer saw the strongest teen employment since 2013, when 1,335,000 teens found jobs. Employment among teens increased by 1,339,000 between May and July in 2016. That was 15.4 percent more than through the same period in 2015, when 1,160,000 16- to 19-year-olds were added to the employment rolls. Last year’s total was helped by heavier-than-usual teen employment gains in July. A total of 492,000 teenagers found jobs in July, according to non-seasonally adjusted data released by the U.S. Bureau of Labor Statistics. The July teen job gains were 33 percent higher than the previous July’s 369,000, and 25 percent higher than the 392,900 July job gains averaged over the previous 10 years. The strong summer hiring brought last year’s total employment among 16- to 19-year-olds to 6,040,000, which is the highest number of employed teens since August 2008, when 6,142,000 teenagers were working. Currently, 4,657,000 16 to 19 year-olds are employed, an increase of 49,000 workers from the previous February. If last summer’s trend continues, that number could jump to over 6 million by August. “With unemployment at 4.7 percent and 200,000+ new jobs a month, older workers and college grads who may have been working part-time or in entry level positions will have more opportunities to move into better positions. We expect slightly more teens to find employment this summer than we saw last summer. “We’ve seen a drop in workers who are working part-time for economic reasons, from 6.1 million last year to 5.7 million in February, and those positions may be well-suited to teen workers. “Even with the recent gains, though, teen employment is a shadow of its former self. The latest figures are well below the employment levels of the late 1990s and early 2000s, when it was common to see 7.0 million to 8.5 million teenagers employed at the peak of the summer job surge. In 1978, more than 10 million teenaged Baby Boomers were working in July,” said Challenger. The percentage of teenagers participating in the labor force has been declining since the 1970s. Currently, only about 32 percent of teens participate in the labor force, a figure that has held steady since the end of the recession. The health of the overall job market could translate into new opportunities for teen workers, as older workers and college grads find employment in higher paying, better jobs. Teens might see opportunities open up in industries that have been adding jobs so far this year, like transportation, hospitality and food service, or construction. “Construction has added over 170,000 jobs in the last six months. This is an area typically left unexplored by teen workers,” said Challenger. “The numbers suggest that more teenagers are finding employment at other times of the year. After all, we are approaching full employment. Many metropolitan areas are already struggling with labor shortages. This environment opens doors for teen job seekers, as those who may have relegated to retail and restaurant jobs are moving up, which leaves a void that can be filled by teens,” said Challenger. Search where others are not. Outdoor jobs involving heavy labor or behind-the-scenes jobs are often not as sought-after by teen job seekers. Look for odd jobs at odd hours. ¬Offer to work evening and night shifts and to fill in for vacationing employees. As a job-search strategy, conduct a search for these types of positions during the hours they operate. Become a door-to-door salesman when selling your skills. ¬Do what good salesmen do -- start on one block and go from business to business, door to door. Don’t simply ask for an application. Take the time to introduce yourself and build some rapport with the hiring manager. Call friends and relatives. Parents and other relatives are often the best source for information on job leads. However, don’t forget to stay in touch with friends and other classmates, especially those who have been able to find jobs. Be a job-search ninja. Wait outside the store or offices of a prospective employer to attempt to intercept a hiring manager upon his or her arrival. Dress for the part. Even if you are applying to work on a road crew, show up to all interviews in nice clothes. You want the interviewer to focus on you and your skills, not on your ripped jeans and paint-splattered t-shirt. Don’t hesitate to revisit employers. The types of businesses seeking seasonal employees typically have higher-than-average turnover. An employer that did not hire you a couple of months ago might need more workers now.